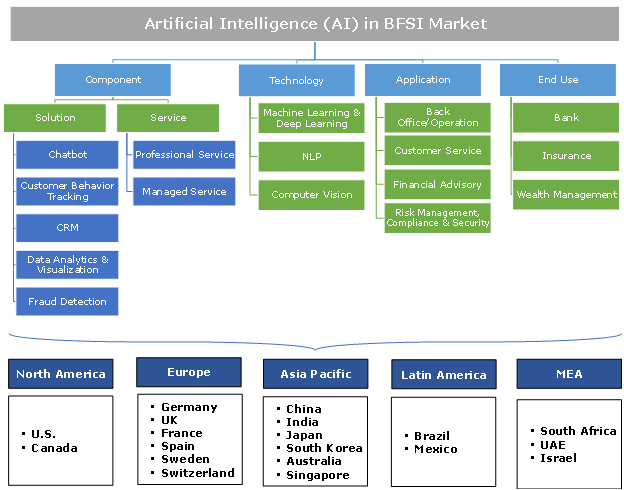 Artificial Intelligence (AI) in BFSI Market size was estimated to be over USD 2.5 billion in 2017 and is anticipated to grow at a CAGR of more than 30% over the forecast timespan. AI in BFSI market is driven by a rapid surge in the digital data. The digital data is anticipated to grow at an annual growth rate of about 40% over the next 10 years. The increasing adoption of IoT devices and advanced technologies, such as Big Data, are the major factors responsible for the surge in the data. Furthermore, the growing adoption of smart devices and internet services across the globe also fuels the growth of the data. It is estimated that by the year 2020, approximately 1.7 megabytes of the new data will be generated every second. This encourages organizations to deploy advanced technologies to extract insights from large disparate data sets. Financial institutes are leveraging on the AI to collect, report, and analyze large chunks of data to extract meaningful insights about the customers to meet their requirements. The ability of the technology to perform tasks, such as processing natural language and recognizing images, speech & text, and advanced machine learning algorithms, is a factor that will augment demand for the technology. However, the enterprises are still reluctant to the adopt the technology due to the data privacy and safety issues associated with the technology. A major concern is the protection of the data used in the machine learning and deep learning algorithms. Hackers can easily reverse-engineer the user data from the machine learning models with relative ease. The solution market accounts for over 85% share in the AI in BFSI market. The increasing adoption of the customized software among the financial institutes is propelling the market growth. Banks, insurance companies, and wealth management companies are using various AI-based solutions such as chatbot, customer behavior analytics, customer relationship management, and data analytics & visualization solutions to extract the actionable insights and improve the customer experience. Customer Relationship Management (CRM) solution is estimated to be the most used solution among the BFSI sector with over 40% share in the market in 2017. The increasing need to provide an enhanced customer experience is the major factor driving the market. As the customers are becoming more empowered and the competition in the market is increasing rapidly, organizations are leveraging on CRM solutions to offer a personalized experience to the user and gain customer loyalty. 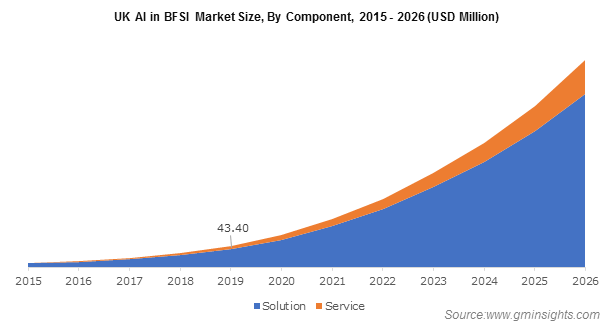 The machine learning and deep learning market is dominating the technology space with over 38% share in the AI in BFSI market. The growth of the market is attributed to the increasing investments in the technology across the globe; as in 2016, approximately USD 6 billion was invested in AI. Furthermore, the wide adoption of the advanced machine learning algorithms in the trading, fraud detection, and anti-money laundering (AML) application promotes the demand for the technology among the financial institutes. The NLP technology also held a significant share in the market. The adoption of text and speech analytics in the BFSI sector to process structured and unstructured data and extract actionable insights help the market to grow. Moreover, the financial institutes are also leveraging on the NLP technology for text mining, cross-border payments, solving insurance queries, and analyzing financial news and market reactions to mergers and acquisitions to make informed predictions and decisions. Customer service leads the application space with more than 45% share in the AI in BFSI market due to an increase in the adoption of the chatbot and conversational AI solutions for assisting customers and solving their queries. Also, the adoption of the CRM solutions in contact centers for analyzing the voice and text of customers to gain meaningful insights helps the market to grow. Furthermore, as the competition among the market players is rising, the companies have started to focus more on providing a better customer experience to gain customer loyalty and get an edge over competitors. Organizations are integrating advanced analytics tools and solutions to analyze customer data to fulfill their requirements, understand the customer experience, and make smarter predictions about their behavior and requirements. Banks account for over 50% share in AI in BFSI market. Banks are focusing more on improving the operations by deploying advanced digital solutions to improve the customer experience and control financial matters. Furthermore, the adoption of chatbots, CRM, and customer behavior analytics solutions in the banks will also help them in improving the market. The increasing investments in fintech companies are also estimated to have a significant impact on the growth of the market. Banks are increasingly collaborating with the fintech companies to integrate the technologies into the banking product and services. Wealth management companies are also estimated to have a significant share in the global AI in BFSI market. The wealth management companies are leveraging the AI technology to analyze financial news and market reactions to mergers and acquisitions to make informed predictions and decisions. Furthermore, these institutes are also utilizing the capabilities of the advanced machine learning algorithms and fraud detection. North America held more than 50% share in the global AI in BFSI market. It is one of the early adopters of the AI technology in BFSI sector. The major factors that are driving the growth of the market are the increasing investments in the AI by the technology giants such as Google, AWS, and IBM. For instance, in 2016, Google has invested approximately USD 20 billion in AI. Furthermore, the favorable condition in the region for the technology start-ups also backs the market. Asia Pacific AI in the Fintech market is estimated to grow at a CAGR of over 40% during the forecast timeline. The growth of the market is driven by the investments by Chinese players such as Baidu, Alibaba, and Tencent in the technology. Also, there are supportive government initiatives in China to develop machine learning and AI-powered economy by the year 2030. For instance, in 2017, China’s Ministry of Science and Technology launched national AI plan to strengthen the development of AI-based applications. The plan aimed at providing funds and policies to contain the risks associated with the technology. This will encourage start-ups and regional players to compete with the U.S. and Europe-based companies, which is estimated to foster the market growth. The AI in BFSI market is characterized by the presence of both multinational players and regional players. The major vendors of the AI-powered solutions in the Fintech sector are Google, Microsoft, IBM, Intel, AWS, SAP, Oracle, Salesforce, IPsoft, Palantir, Lexalytics, Inbenta technologies, Next IT, and Interaction. The major market players are leveraging on the merger & acquisition activities to gain the main market share, expand product portfolio, and gain technical expertise. For instance, since 2010, Google has acquired more than 25 AI-based companies to enhance their capabilities and expand the product portfolio. However, start-ups are leveraging on product innovations and fund-raising activities to gain a competitive edge. For instance, Inbenta Technologies has raised total funds of about USD 14 million in two rounds of funding to increase its customer base. AI technology is the combination of computer science, machine learning, NLP, and computational linguistics facilitating the interaction between the computer and human language. The technology has gained a significant level of sophistication due to the rise of machine learning and deep learning algorithms. As the competition among the market players is increasing rapidly, financial institutions are shifting toward the technology to provide enhanced customer experience and improve the operational efficiency.